HC3R clip-loaded magazine for 10-22. This entry was posted in ammunition, rifle and tagged 10-22, 22LR, AllOutdoor. Bookmark the permalink. It’s still not a “thirty magazine clip” but it’s close. I’m not fully understanding the intended field use. Instead of swapping out magazines, I’m swapping out clips. So I keep extra, loaded clips in my pocket, or is there a clip pouch or bandoleer in the works? Neat. Seems like a built in speed loader to me. Mag spring gets compressed so you just have to slip rounds into the clip, seat the clip into the mag body then release the spring to have a loaded mag. Quite a bit easier & quicker than feeding 25rds thru the feed lips and against the mag spring especially for people with reduced strength or dexterity, i’d imagine. Also looks like there is a spot (left side on picture) to store an extra clip. For squirrel hunting this would be convenient. You’d have 50rds (or 40 – pic only shows 20rd in that clip) and after shooting the first clip, reload the second very quickly without having to carry an extra mag. I really like the concept, to be honest. Arne Boberg beat them to the punch, with his “magazine clip”. 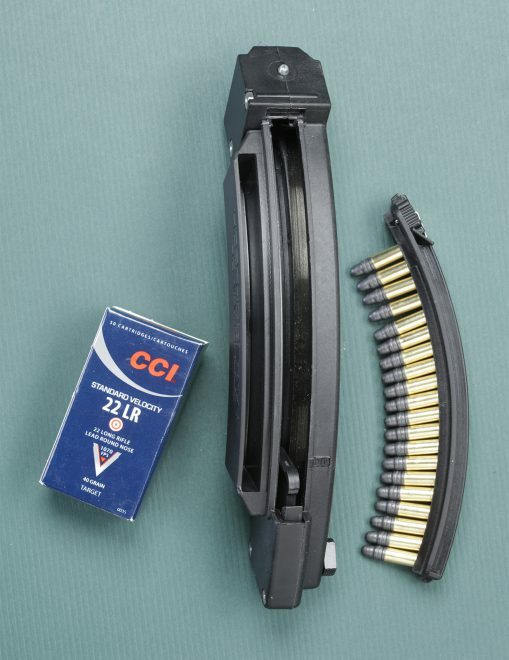 It’s a feature of the magazine for the XR-45, which has the sheet metal bent to create a lip that engages the case rims to hold the cartridges (more or less) in the correct position for the action to pick up.